Etzioni has recently proposed that the success of Internet enabled commerce is surprising due to what I label the “trust in strangers” problem. In here responding to Etzioni, I argue that the “trust in strangers” problem effectively dissolves once it is recognized that current manifestations of Internet commerce are not associated with high levels of anonymity, but rather, with high levels of surveillance. In doing so, I first outline how data capitalism and security considerations have contributed to Internet surveillance being close to ubiquitous. Following this, I differentiate between three types of surveillance—i.e. top-down, bottom-up, networked—that many people who digitally connect rely upon. In concluding, I emphasize my basic argument. Namely, that it is “trust in surveillance”, rather than “trust in strangers”, that supports current manifestations of commerce online. 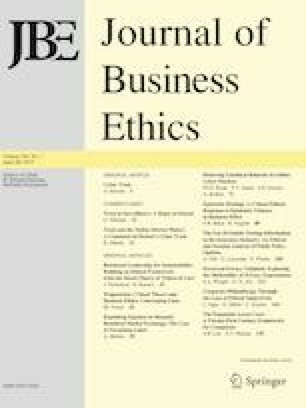 Editors at the Journal of Business Ethics are recused from all decisions relating to submissions with which there is any identified potential conflict of interest. Submissions to the Journal of Business Ethics from editors of the journal are handled by a senior independent editor at the journal and subject to full double blind peer review processes. I would like to thank Ed Freeman for inviting me to make this reply. I would also like to thank the anonymous reviewer for their very helpful and critically constructive comments on a prior draft. Agren, D. (2017). Outrage as Mexican student killed after using ride-hailing service. The Guardian, September 18, 2017. https://www.theguardian.com/world/2017/sep/18/mexico-woman-murder-student-ride-hailing-service-cabify. BBC. (2017). Uber London loses licence to operate. BBC News, September 22, 2017. http://www.bbc.com/news/uk-england-41358640. Bhattarai, A. (2016). How Uber plans to put its own drivers out of business. The Washington Post, August 18, 2016. https://www.washingtonpost.com/news/business/wp/2016/08/18/how-uber-plans-to-put-its-own-drivers-out-of-business/?utm_term=.98ed6b7008a6. Change.org website. (2017). Save your Uber in London. https://www.change.org/p/save-your-uber-in-london-saveyouruber. Accessed 22 & 25 September 2017. Fry, E., & Rapp, N. (2017). This is the average pay at Lyft, Uber, Airbnb and more. Fortune, June 27, 2017. http://fortune.com/2017/06/27/average-pay-lyft-uber-airbnb/. Goldfeder, S., Kalodner, H., Reisman, D., & Narayanan, A. (2017). When the cookie meets the blockchain: Privacy risks of web payments via cryptocurrencies. arXiv, August 16, 2017. https://arxiv.org/abs/1708.04748. Hawkins, A. J. (2017). Uber’s CEO caught being a jerk on camera by one of his own drivers. The Verge, February 28, 2017. https://www.theverge.com/2017/2/28/14766868/uber-driver-argument-ceo-travis-kalanick-video. Khalid, A. (2016). 7 Essential apps that will keep you safe at night. The Daily Dot, January 8, 2016. https://www.dailydot.com/debug/best-apps-for-personal-safety/. Levin, S. (2017). Sexual harassment and the sharing economy: The dark side of working for strangers. The Guardian, August 23, 2017. https://www.theguardian.com/business/2017/aug/23/sexual-harassment-sharing-economy-uber-doordash-airbnb-twitter. Matthews, N. (2014). Why women need personal safety apps. Elle, May 1, 2014. http://www.elle.com/culture/tech/news/a14941/womens-safety-apps/. McCarthy, K. (2017). Dear racist Airbnb host, we’ve enrolled you in an Asian American studies course. The Register, July 13, 2017. https://www.theregister.co.uk/2017/07/13/racist_airbnb_host_punishment/. Nakamoto, S (2008). Bitcoin: A peer-to-peer electronic cash system. Gmane, October 31, 2008. https://bitcoin.org/bitcoin.pdf. Penney, J. W. (2017). Whose speech is chilled by surveillance? Slate-Future Tense, July 7, 2017. http://www.slate.com/articles/technology/future_tense/2017/07/women_young_people_experience_the_chilling_effects_of_surveillance_at_higher.html. Pew Research Centre. (2016). Americans feel the tensions between privacy and security concerns. Fact Tan, February 19, 2016. http://www.pewresearch.org/fact-tank/2016/02/19/americans-feel-the-tensions-between-privacy-and-security-concerns/. Pew Research Centre. (2017). The fate of online trust in the next decade. http://www.pewinternet.org/2017/08/10/the-fate-of-online-trust-in-the-next-decade/. Accessed 22 September 2017. Rosenblatt, A. (2017). How drivers shame Uber Lyft passengers. Medium, May 29, 2017. https://medium.com/uber-screeds/how-drivers-shame-uber-lyft-passengers-c0d83539460a. Shrubb, R. (2015). How do you beat bad buyers on Amazon and eBay? WebRetailer, December 7, 2015. http://www.webretailer.com/lean-commerce/bad-buyers-amazon-ebay/#/. Solon, O. (2017). Airbnb host who canceled reservation using racist comment must pay $5,000. The Guardian, July 13, 2017. https://www.theguardian.com/technology/2017/jul/13/airbnb-california-racist-comment-penalty-asian-american. Teaching Privacy website. (2017). Principles: There is no anonymity on the Internet. http://www.teachingprivacy.org/theres-no-anonymity/. Accessed 19 September 2017.